Experience the view from the Shard. The Shard is an iconic, landmark building on the London skyline. Visit the newest and highest attraction that London has to offer. 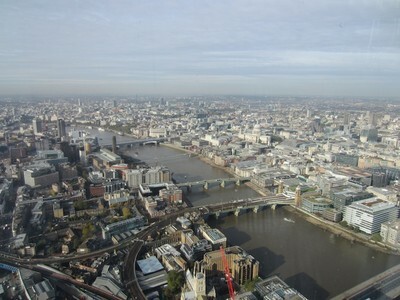 The Shard will be open to the public from February 1 2013. This is the tallest building in Western Europe and it redefines London’s skyline. The Shard already is a dynamic symbol of London, recognizable throughout the whole city. The View is situated at the top of The Shard, on floors 68, 69 and 72, and almost twice the height of any other viewing platform in London. Traveling skyward in two high-speed ‘kaleidoscopic’ lifts, you’ll swiftly reach Level 68 - a cloudscape above the world.Then journey to Level 69 where the view is revealed and London opens out before you. Here, in the sky above London, you’ll experience an astonishing 360 degree, 64km (40mile) view over the city.For the best view in town, ascend to Level 72, at 244m, the highest public level of The Shard. You’ll be exposed to the elements with sounds of the city around you. Looking up, you’ll see the shards of glass that form the top of this skyscraper as they disappear upwards into the sky. You need to buy tickets in advance to ensure a premium quality experience with no waiting and no queues. Tickets can soon be bought on Youropi.